Handbags are often considered an appendage by many women, in fact, we rarely go any place without them. But those who care about animal rights, the environment and ethically sourced goods know that the huge demand for and production of handbags has environmental consequences, in addition to promoting cruelty to animals. Vegan handbags, on the other hand, are produced without using animal products and will often be constructed from environmentally friendly materials too. 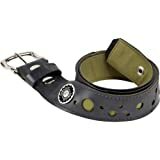 Of course, it isn't just vegans and committed environmentalists who buy such products, but those care about the future of the planet and recognise that the earth's resources are finite. Vegan handbags are items which have been manufactured without using any animal products or byproducts. Although not always the case, the manufacturers of such goods will often consider environmental factors and opt to use materials and processes which do not have any negative or damaging effects on our world. Furthermore, there is usually some emphasis on fair trade and ensuring that the worlds most vulnerable people are not exploited in the pursuit of profit. Of course, synthetic materials which mimic leather may be used to make handbags and other products, but if they have not been labelled as a vegan product there is still a possibility that animal products may have been used. For example, glue is often used when manufacturing products such as handbags and may contain animal byproducts- and some non leather goods may also contain silk linings or traces of wool. Products labelled cruelty free simply mean that the product has not been tested on animals, but animal products may have been used during the process of manufacture. Labels suggesting that the product is non-animal mean that it has not been produced using animal or animal byproducts, but unless otherwise stated there may have been some animal testing involved during, or prior to, manufacture. And no kill products are those which have not involved the killing of an animal to make the goods, but may have used products derived from an animal who has died naturally. This is a more common in countries where certain animals are considered sacred. The only way to be certain that you are buying goods which contain no animal products or byproducts and have not been tested on animals is to seek out those labeled as vegan. 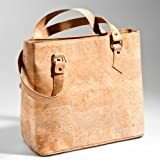 Vegan handbags which have been manufactured from cork. Cork comes from the bark of the Cork Oak tree and is becoming increasingly favoured when it comes to making earth and vegan friendly products. Because the Cork Oak tree is an evergreen, the tree can regenerate it's bark, making cork both a sustainable and renewable resource. Not only is cork a vegan and eco friendly option, but there are a number of other advantages when it comes to buying products which are made from cork. In fact, not only is cork water resistant, but fade resistant too- so essentially you can use your new bag in bright sunlight and allow it get wet when it's raining without worrying about damage. 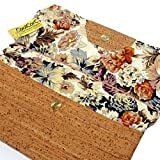 Cork is also a natural insect repellent, durable, lightweight and fire resistant, as well as making an extremely attractive fabric for making bags and purses. A cork handbag is a product of very high quality and will look good for years to come. 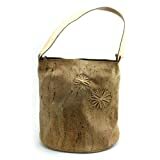 Follow the links to Amazon.com to view the full range of cork handbags available. Recycled rubber tyres and old inner tubes are another favourite with eco friendly and animal rights groups. As of 2003, a European directive made it illegal to send old tyres to landfill, however, many people found a way around this problem by shredding and then dumping their old tyres. Unfortunately, the directive did not include tractors tyres, or those tyres from large trucks or bicycles. New tyres which had been been rejected at the quality control stage were also disregarded from the regulations. In 2004, more than ten million tyres were sent to landfill in Europe alone, and this figure does not include shredded tyres! Handbags made from re-cycled rubber make excellent handbags. 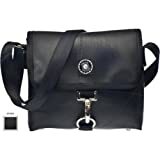 As one can imagine, they are exceedingly durable and hard wearing which means you'll never have to worry about the handles snapping or the seams giving way because of the weight of the items in the bag. They are also easy clean and the range of designs makes for some stunning handbags. Just Follow the links to view the full range of recycled rubber handbags at Amazon.com. Other materials used to make vegan and eco friendly handbags. Innovation leads the way when it comes to finding materials suitable for vegan and earth friendly products. In addition to utilising products such as recycled paper, manufacturers are also using organic fabrics like hemp and cotton. And designers have become even more imaginative during recent years. Old bottle tops, bamboo, cane, recycled upholstery fabrics and more are making their way onto the high street. Buy vegan and eco-friendly handbags in the knowledge that you are, not only preventing cruelty to animals, but helping to save our world at the same time. Friendly Made! No animal products and PVC-Free. Soft to the touch and pure style all hand-made. Perfect for around town with this slim bag to carry just the essentials. With lots of vintage charm and a modern twist, Lux de Ville Handbags, Totes and Wallets are the perfect accessory to complete any girls outfit. I like that bag, Sheilamarie. I think the flowers add that bit of decoration but it's still really natural looking. I like that cork one, too, Hollie. The picture introducing your article enticed me to read your article. Very pretty. Thanks for the article. I'm an animal advocate, and I keep forgetting that things other than food come from animals. I really like the cork bags 2uesday. My friend has one and it feels like a really soft suede. I also really like the way the fabric differs in shade and tone.